Have your vacation plans ever been a wash due to rain? Most of us envision ourselves enjoying a perfect holiday, filled with sunshine and ideal weather. While it's great when everything works out that way, though, we can't control how the forecast is going to turn out. For trips to a theme park or the beach, the rain can really end up spoiling all the fun. A getaway to the cabins in Helen, Georgia, on the other hand, will never leave you bored or disappointed - no matter what's going on outside. Unlike other vacations, your accommodations while staying in Helen will be a huge part of your travel experience. 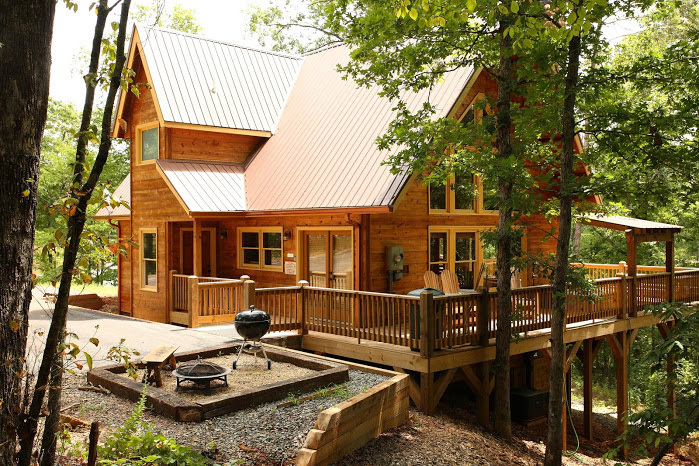 Luxurious cabin rentals are packed with incredible amenities that will give you plenty to do, and plenty of space to enjoy those activities in so that you never develop a case of cabin fever. And if you really are itching to get out and explore the area, there are plenty of things to do and see throughout the area that won't require you to get wet. So what do you do when it rains in Helen? Here's a guide to keeping yourself and your loved ones entertained - both inside the cabin and out. Pop in a movie - Prepare some popcorn in your cabin's fully equipped kitchen, and get ready to snuggle under the blankets in your living room as you enjoy a movie with one another. Your cabin will feature a flat panel TV and DVD player so that you can enjoy some quality together time and pass the hours laughing at comedies or shrieking at horror films. Can't agree on what to watch? Pick a cabin with TVs located in each of your private bedrooms. Enjoy a crackling fire - If you have selected a cabin with its own fireplace, there's no better time to take advantage of it that on a rainy day. There's something about a hot, crackling fire that creates an inviting and cozy atmosphere. You can spend hours telling stories or playing board games in front of the fire place and soaking up its warmth and light. You may also enjoy toasting marshmallows, or just putting your feet up and taking in a good book while the fire pops nearby. 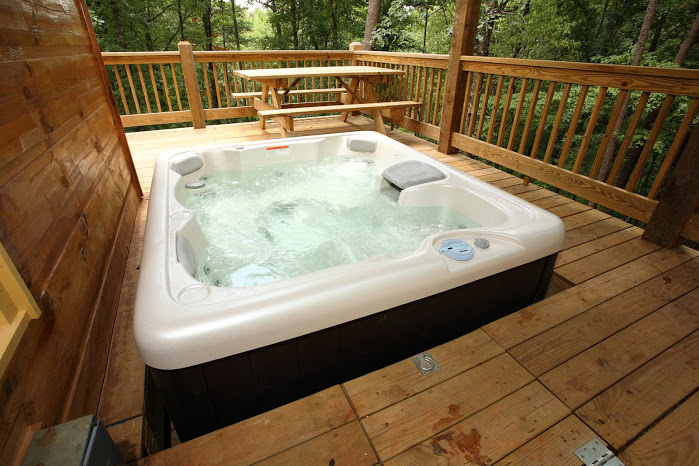 Soak in the hot tub - Another great way to stay warm on a cool, drizzly day is by relishing a long, soak in your cabin's private hot tub or Jacuzzi. Let the warm water sooth your skin and your spirit as you take in the spectacular, hazy mountain views, read a book, sip on a glass of wine, or just enjoy the company of your family and friends. You'll feel a lot better when you get out - guaranteed. Get competitive - Many of the luxury Helen cabins feature a game room with options like Pool, Foosball, and Ping Pong. When the clouds roll in, gather the family in your game room and challenge them to a few rounds of your favorite games. Make it fun by competing in teams, or offering a prize to the winner. Time flies when you're having fun, and before you know it, the rain will have stopped and the skies will be clear in Helen once more. Just because there's a lot for you to do inside of your cabin on a rainy day doesn't mean that you can't leave. You might choose to check out the spectacular model railroad at Charlamagne's Kingdom before heading over to the Sautee-Nacoochee History Center to learn about the areas rich heritage. The Gourd Place is also a fun stop for those who are visiting the area, intriguing and delighting all. You could even decorate your own pottery to be shipped back home when you visit The Willows Pottery right in downtown Helen. There are plenty of places for you to explore and things for you to do, even when it rains. Who says that rain has to ruin your vacation plans? When you book a stay in a luxurious Helen cabin rental, you'll have a blast no matter what the weather is like. How would you keep yourself entertained on a rainy Helen day?